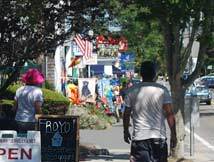 Harwich Port has become one of Cape Cod’s hottest, hippest places to eat, and you don’t have to travel far from the Seadar Inn to take in the restaurant scene. From casual neighborhood restaurants serving gourmet pizzas and eclectic pubs perfect for taking in a big sports event to fine dining in a sea captain’s house, Harwich Port has it all. Harwich and East Harwich also boast plenty of fine dining along with breakfast, lunch and pizza restaurants. Start your day with breakfast at Bonatt’s Bakery, a local landmark on Route 28 in Harwich Port since 1941. Little has changed. The mini scones and Oreo truffles still melt in your mouth. And you can’t beat the daily luncheon specials such as roast turkey, homemade meatloaf and pot roast, each priced at under $10. For lunch, you can’t go wrong with George’s Pizza House, the Land Ho! or Brax Landing, all in Harwich Port. The view of Saquatucket Harbor from Brax Landing. Jennifer Kain DeFoe photo. George’s Pizza House has been family-owned and operated for nearly 50 years and has been voted “Best Pizza” in polls conducted by local newspapers, magazines and the Chamber of Commerce. Whether selecting your own toppings or choosing a gourmet pie (the Farmer’s with feta, tomato, chicken, onion, olive oil and oregano is mouth-watering), they arrive at your table perfectly crisp and tasty. Dark paneling, local signage and a nautical décor give the Land Ho! 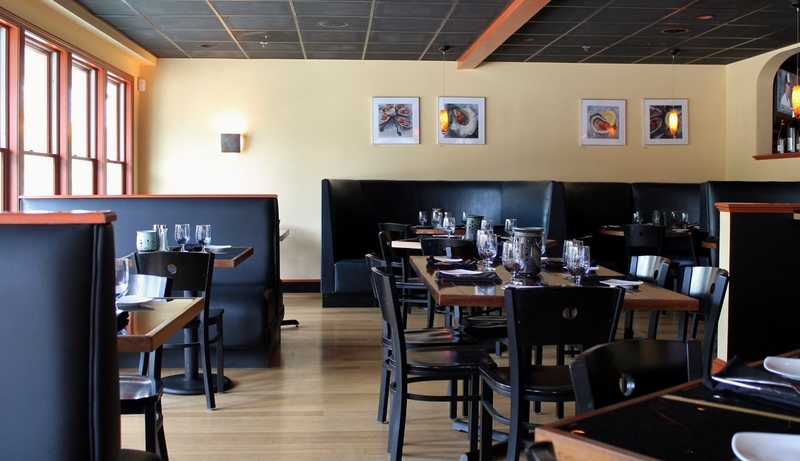 a laid-back atmosphere conducive for a relaxing lunch of fried clams, chowder or steak tips. The outdoor raw and cocktail bar with a flat-screen television is ideal for a leisurely lunch on a sun-splashed afternoon. With 14 bottled beers and ales, and 12 more on tap, quenching your thirst won’t be an issue. 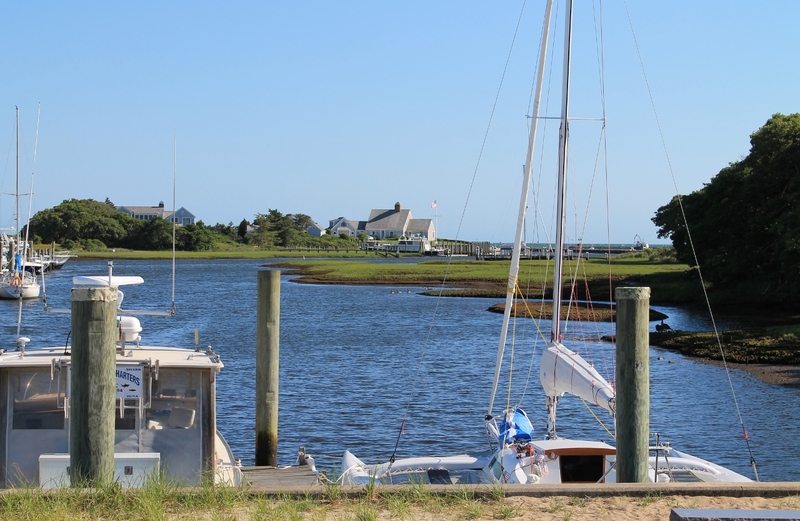 Brax Landing overlooks Saquatucket Harbor and has attracted visitors for decades for its spectacular view and value. Watch the boats pass from the outdoor deck while choosing from a menu where virtually every entrée is less than $20. Diners rave about the lobster roll. A dish at Viera. Photo via website. 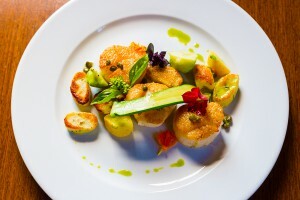 Searching for a casual dinner with the family, Viera in West Harwich serves up seasonal, locally sourced bites, plus a tasting menu and specialty cocktails. The bread and pasta are homemade, while local farms provide the produce and other products. Appetizers include Pleasant Bay razor clam’s ceviche, coconut curry Chatham mussels and Barnstable oysters. 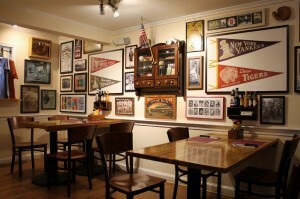 At the Hot Stove Saloon, located in the center of Harwich Port, you can catch the biggest sports events while dining alongside a vast collection of memorabilia, some of which dates back to the early 1900s. Don’t forget your complimentary baseball cards on the way out the door. The Hot Stove Saloon. Jennifer Kain DeFoe photo. 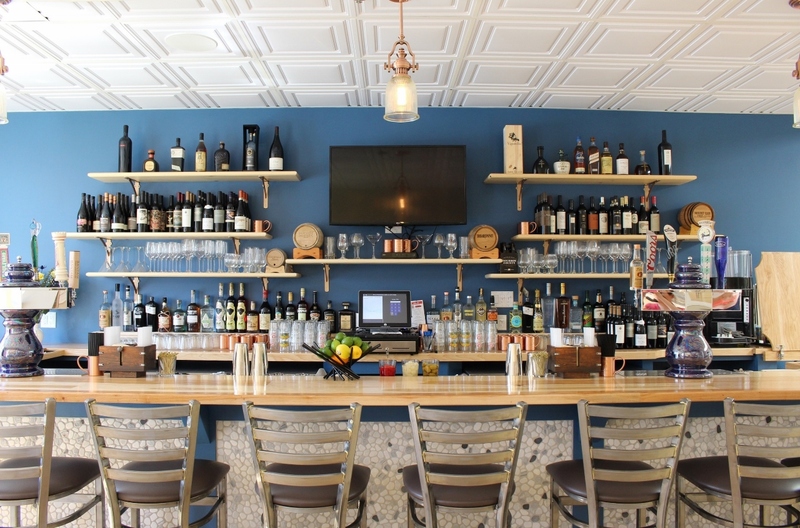 The Mad Minnow Bar & Kitchen in Harwich Port serves up sushi, falafel, corn dogs, gazpacho, summer ribs and Cape cioppino, just to name a few selections, in a comfortable, casual setting, while Ember, also in Harwich Port, is the choice of many locals for its coal-fire pizza and wings. For fine dining in Harwich Port, the Cape Sea Grille features an ever-changing American menu featuring native seafood and fresh local ingredients. Situated in a 19th-century sea captain’s home just steps from the water’s edge, the restaurant cultivates a relaxed yet elegant atmosphere with white linens, warm candle light and fresh cut flowers. The extensive but reasonably priced wine list offers 20 wines by the glass and 100 bottles. The Port. Jennifer Kain DeFoe photo. 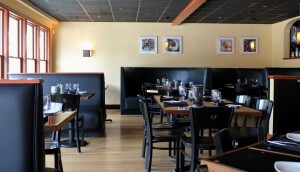 The Port Restaurant, located on Route 28 in Harwich Port, is a sleek and stylish restaurant that also includes a bustling bar with a mammoth TV and live music. Don’t miss the nightly special where you can get raw oysters for only $1. Finally, for a bit of romance, head to Buca’s Tuscan Roadhouse in Harwich. Settle into a table tucked in an alcove in the intimate brick-walled dining room and enjoy homemade pastas prepared with a variety of imaginative sauces. Where else can you find wild boar meatball, sweet sausage and tagliatelle pasta in a Tuscan tomato sauce topped with ricotta cheese and shaved pecorino pasta? So, when it comes to Harwich Port restaurants, the choices are virtually unlimited, and the drive (or walk) from the Seadar Inn will never be far. Top photo: Mad Minnow Bar & Kitchen. Photo via website.